Hey. I am reding your blog for few months and I really love those photos. I live in Latvia (it’s in Europe,near the Baltic sea)…and i have all those vegetables growing in my garden…it’s not so hot here so my peas and other vegetables aren’t growing so fast,they’re not mellowed yet…photo i like the most from those is the one with flowers – cresses…and did you now you can eat them and put them in salad too?we are doing like that here. I bought garlic scapes a week ago at my local farm and roasted them with turnip (also from the farm), some olive oil, salt & pepper–it was delicious together, but I could have eaten the garlic scapes on their own. They were sweet and garlicky like a regular roasted garlic clove, but with a nice crunchy texture. Come on, it’s like asking which of your children you like the best. But the last one really is awesome! I like the first one, mostly because I can see what is what as I read your post. Don’t get me wrong, the last photo is gorgeous too. I preferred the first photo! You can boil, season and mash kohlrabi like turnips or potatoes, and it’s quite good. Haven’t tried it yet, but I do have it on good authority! The first shot is, as you said, easier to make out but I think the colors look better in the last one. Richer? Either way, they both look delicious. what a great way to make yourself try new veggies. so good!! Hmm…which one is better? Both are great, first one nice and close up to see everything, but the last one is like…Look at all my winnings! 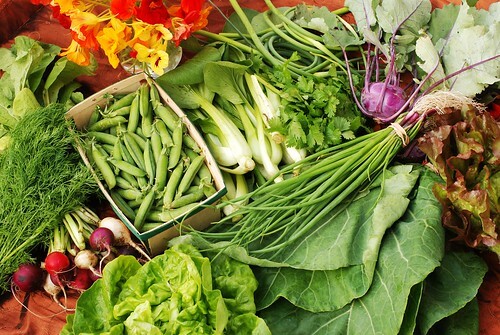 I can only dream of the day when my garden is full and lush and producing beautiful veggies like yours! Look at all that wonderful loot! 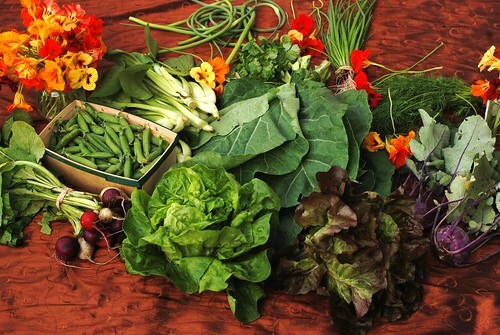 I live in the midwest so my CSA doesn’t start until July 11 – can’t wait! Mine includes a dozen organic eggs, and my portion for 8 weeks cost $270. My sister just bought garlic scapes – neither one of us had ever heard of them before. I only like cucumber growing up because they weren’t cooked. I didn’t realize until well into my adulthood that I even llike any other vegetable – turns out my mom just cooked the hell (and flavor) out of veggies so much that I just assumed I didn’t like anything! Now baby spinach, spaghetti squash, multi colored peppers, jalapenos play a key role in my cooking! You asked, just as I was saying, “Wait? Is that the same set-up? I like it so much more!” I scrolled to the top of the page, and for the first time in a long time, decided that cropping does not necessarily make a shot better. Usually, yes. But not always. It’s a couple of things. I really like the textured pattern on the surface of the table (?). And I like how the wider shot is more organic*. Which is part of what is good about the pattern, too. Of course, ALL of your pictures are ALWAYS amazing. Love this place. *In the first shot, I didn’t even notice the clever curlicues of the scallions. 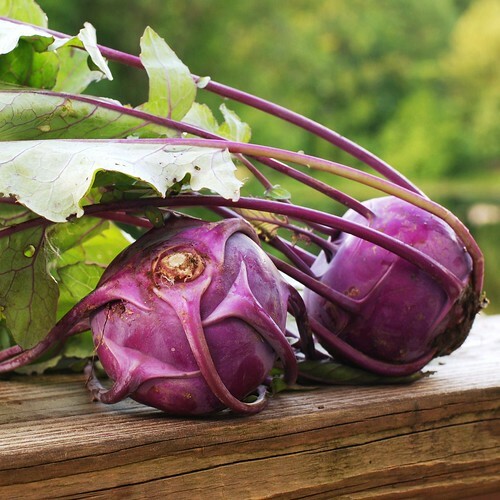 Kohlrabi was always a staple in my dad’s home growing up in MN. He still to this day just slices it, salts it, and eats it raw, which is what I do, too. I tried it in my garden this year, but it didn’t take (just too darn hot here in KS). Last summer I bought some at the farmer’s market and shredded it and put it over whole wheat pasta with ricotta cheese, Parmesan, shredded carrot, and a little lemon juice. I’d have to dig up the exact recipe….if I think about it I can post it on here later. Quite tasty! those flowers look a lot like nasturtiums, which are edible and incredible!! 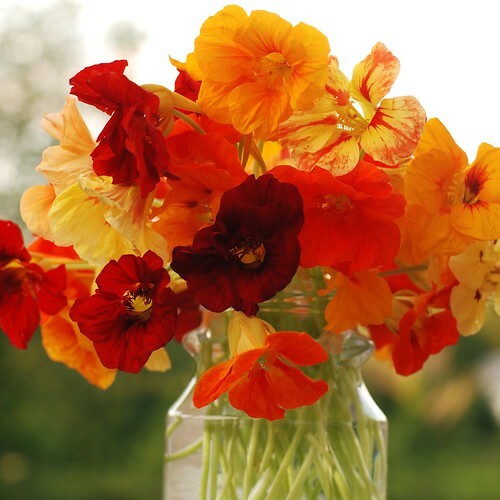 if they are nasturtiums, try them on a salad! I’m so not taking sides. You two can fight amongst yourselves! 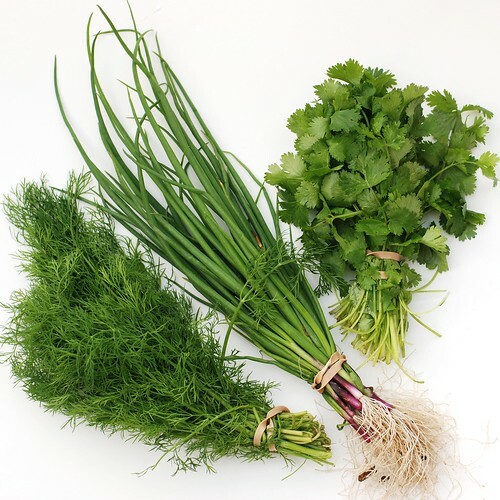 I also adore fresh herbs. I am fairly good at growing them; not very good at keeping them alive. I suspect I over-mother. I’ve been using them whenever I can get them since I first tried them a few years ago. Many of the local stands carry them through the entire season. I’ve found two things with them… the first one, you’ve already caught (though, they can be added at the end of a dish, particularly a stir-fry, and still retain their flavor), the second is that they tend to be a bit firmer and more fibrous than scallions, so they need to be sliced very thin, and can’t be used in a lengthwise cut (common in asian dishes as a late addition or a garnish). Glad to hear that you guys are enjoying your CSA… your initial CSA posts inspired me to look for one at the farms I frequent, and I found a wonderful one at Springdell Farm in Littleton, MA. The biggest bonus so far is that they grow berries, have their own chickens (so lots of fresh eggs), and have their own Black Angus cattle that are locally slaughtered and processed (at the last operating slaughterhouse in the state of MA)… the 2lb. of ground sirloin in our first week was a huge surprise! Thanks for the tip toward supporting local agriculture! Gotta say, I like Dano’s preferred shot better. Somehow it looks more luscious and bountiful,more like an artscape. 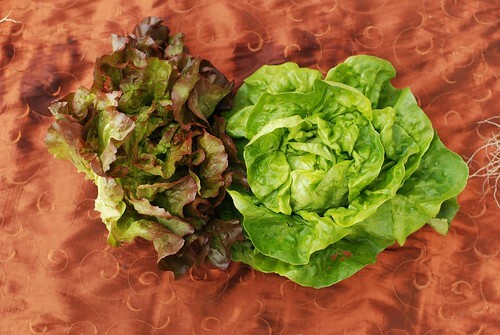 Glad you’re enjoying your CSA goodies and are learning new tricks of the trade in preparing unfamiliar vegetables. We’re enjoying produce, eggs, milk, and meat from a CSA for the first time as well. It’s all organic, and we’re having fun deciding how to make the best use of it. As always, LOVE your blog and your amazing photos! The kohlrabi (kålrabi in Norwegian) is used a lot in traditional Norwegian dishes, especially mashed and served with mutton for Christmas on the west coast. 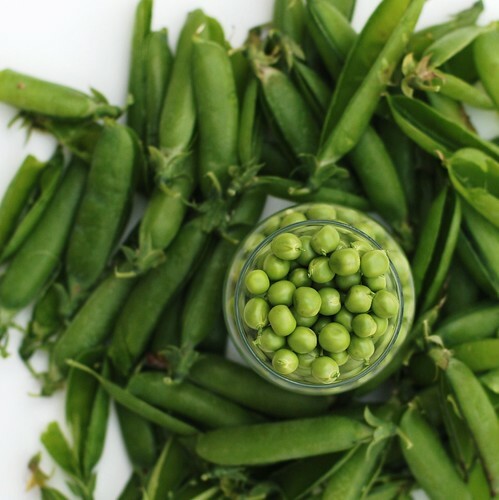 Just cut it into manageable bites, boil it, and mash it with a bit of boiled potato or carrot and salt and pepper, possibly a little bit of butter for that traditional, home cooked feel. Works wonderfully with any traditional, meaty dish. Just feel I had to stand up for the poor thing, it does have its uses! I’ve been following your blog since I stumbledupon the site a few weeks ago. I usually end up checking it during some of my slower classes. I was getting my daily nom fix when my neighbor kindly asked me to navigate away from the page because the delicious photos were distracting her. Clearly you are doing something right! Keep photofoodblogging because you’re fabulous at it! I don’t always have time to read all the blogs I come across, I tend to dip inside & see what else is there. However I know a good blog when I see one! I always see one here! I love the photo’s & the content…I’m also expecting a foodie delivery (organic) in the next few days and I have no idea what will be inside!! Hello there…i’ve been reading ur blog for quite sometimes..and i found it so interesting especially with those recipes..yumss….actually i have a few questions to ask from the expert like u..how can i leave my question to u?appreciate if u could email me 😉 Thanks so much in advance..
What’s happened to the nommins? I neeeds your postings. All of them. Slavish! Almost a month and no oms or noms ;_; I hope you’re okay! 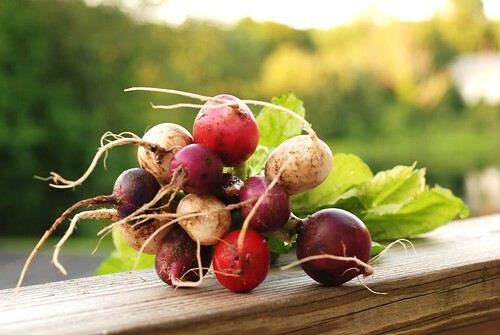 Radishes are great if you boil the for a few minutes, then quarter them and fry like breakfast potatoes or you can use them in soups and stews. I had great radish corned beef ‘hash’ when I was lowcarbing one St Patty’s day.